Dr. Jillian Stansbury, botanical medicine professor extraordinaire, joins us on NatNotes as a guest blogger, waxing poetic on the physical and metaphysical aspects of the Solanaceae family of plants! The Solanaceae family consists of numerous common foods, medicines, and notable poisons. The plants are mostly herbaceous, although some small trees and shrubs are included in this family. As a group, all of these plants possess lush and fast-growing foliage that tends to have an animal-like odor (almost a stench in some species!). For food plants in this family, farmers have long noted that the best tomato fruits or potato tubers are produced when the exuberant growth is heavily pruned or pinched back, curbing energy flow to new flowers, and routing it into the plant and fruits instead. These plants are heavy feeders with a high nitrogen requirement; the richer the soil, the more luxuriant the growth. The plants also nearly all produce tube-like flowers; from the tiny multi-petaled yellow flowers that fuse into a tube at the base, as in tomatoes, to the large and showy bell-like flowers of the Datura. When the flowers are divided into petals, the number is often five. The pattern of leaf growth is an ever-expanding branching, where new shoots and stems emerge from the previous flower-stem junction. As the plants do not tend to become woody, and do not display a pronounced verticale, this lush growth will tend to flow outward and horizontally once the plant has achieved a certain height. Chemically, the Solanaceae family is noteworthy because of the high alkaloidal content. These alkaloids are responsible for the central nervous system effects of Belladonna, Datura, Mandragora, and others, as well the joint pain and allergic inflammation experienced by some individuals ingesting potatoes, tomatoes, or eggplant on a regular basis. Many of the alkaloids that affect the CNS and act as narcotics, mydriatics, and anodynes are in a group known as the tropane alkaloids. These alkaloids are known to bind to beta-adrenergic nerve receptors, having an overall parasympathetic action, releasing muscle spasm, excessive digestive cramping, and nervous agitation. The tropanes also bind to some vascular receptors, causing vasodilation, especially peripherally, which can lead to flushing at high doses. The word Solanaceae is derived from solanum, meaning “I ease,” as in easing pain, but also relates to the ancient Sol, referring to the sun. The common name ‘Nightshade’ further points to an association of this family with the light/dark duality. 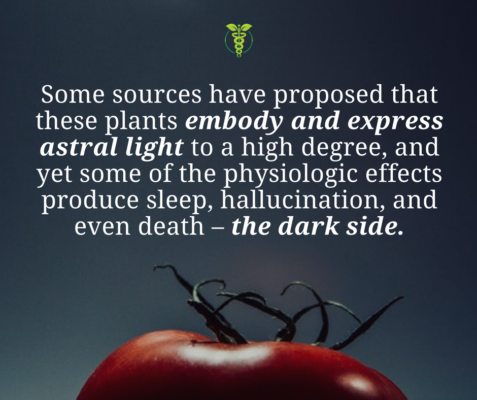 As discussed below, some sources have proposed that these plants embody and express astral light to a high degree, and yet some of the physiologic effects produce, sleep, hallucination, and even death – the dark side. Some Anthroposophical literature has said that the Solanaceae family “eliminates the controlling force of the human ego so that mental processes (Thinking, Feeling, Willing) become autonomous, and thereby the soul life becomes confused and disorganized. It is revealing that most animals are highly resistant to these poisons as experiments have shown. The poisonous Solanaceae are too highly developed plants, so much so that man cannot tolerate them in his body”1 Rudolph Steiner spoke of a “pressing in of astral forces” leading to the formation of strong, poisonous, hallucinogenic, or strongly stimulating and sedating compounds in plants. He felt the astral forces came to be expressed in the material substances of the plant, rather than being altered and merged with earthly forces, which is more typical of plant compounds – a balance between astral and earth. Many metaphysical approaches have looked at the effect that a plant has on the body as a manifestation of its spirit or will. In this context, the Solanaceae might be said to be very willful. They are animal-like both in spirit and in chemistry. The tropanes, like all alkaloids, are high in nitrogen. One of the primary differences of plant and animal biochemistry is that plants are glucose/carbohydrate-based while animals are amino acid/protein based. Plants that are high in nitrogenous compounds such as amino acids and alkaloids tend to have pronounced physiologic effects on animals. Although the Solanacea do not “fix” nitrogen as the Leguminoseae do, they tend to morph nitrogen in a myriad of creative ways having more drug-like and less food-like effects compared to the legumes. For a full list of Dr. Jillian Stansbury’s online continuing education coursework on botanical medicine, please visit her instructor profile here. Dr Jillian Stansbury is a licensed naturopathic physician with 30 years experience, specializing in women’s health, fertility, PCOS, adrenal and thyroid disorders, and endocrine imbalances. She also treats immune and allergic disorders, and chronic disease including diabetes, osteoporosis, metabolic syndrome, and heart disease, as well mental health disorders including anxiety and depression. Dr Stansbury served as the Chair of the Botanical Medicine department at the National College of Naturopathic Medicine in Portland, Oregon and remains on the faculty. Dr Stansbury enjoys keeping up with the latest research in natural products chemistry and sharing the developments with other health professionals, as well as delving deeply into traditional and folkloric wisdom on the uses of plants as foods and medicines. 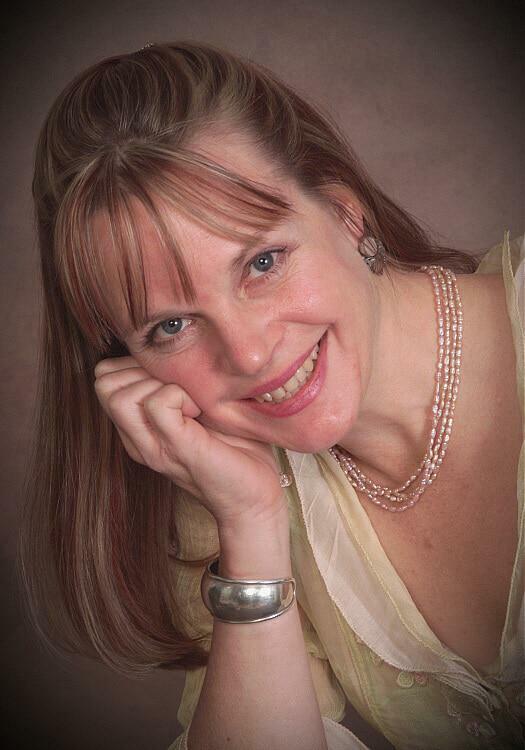 Dr Stansbury compiles her research and presents some 10-20 original research papers at medical conferences each year, and has published numerous scholarly articles and several books, including Herbs for Health and Healing, and PCOS Health and Nutritional Guide. She is the author of Herbal Formularies for Health Professionals – a comprehensive herbal formulary text based on her decades of research and clinical experience (published by Chelsea Green). Dr Stansbury is also an ethnobotanist and has conducted field studies in the Peruvian Amazon for over a decade, living and studying with the Wachiperi, Matstigenka, Bora, and Yagua communities for many years, as well as studying Andean plants. She has created photo, video, and herbarium archives of the plants that she has learned and has published several books on this material as well, including Stung by the Rainbow, and the Mystical and Medicinal Plants of the Andes and Amazon. She leads ethnobotany field courses for nature, adventure, and plant enthusiasts in the Iquitos and Manu regions of the Peruvian Amazon each July 20-30, and winter holiday. Email Dr Stansbury for more information at jstansbury@ncnm.edu.